This past Sunday Wes and I traveled to Queens to visit Corey, Daisy and Desi. After a quick trip into Ikea and a delicious lunch of Desi food (food from southern Asia) we went to the Town of Hempstead LI, Marine Nature Study area. Wes and I had never birded a salt marsh so every bird we saw was a new experience. I finally saw a Greater Yellowlegs, but was too far away to get a good picture. Ditto on the Glossy Ibis, the Black-crowned night-heron and the Oystercatcher. 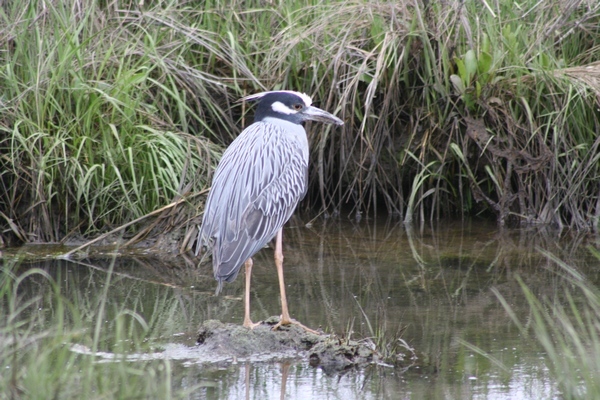 However, that was not the case with the Yellow-crowned night-heron, who obligingly posed for pictures.